Keshav is a renowned painter from Chennai, South India, who Tweets a Krishna a Day @keshav61 to thousands of followers. He also works as a cartoonist for The Hindu, an English daily newspaper. In his home Keshav has made a wall-sized painting depicting numerous important stories from the Srimad Bhagavatam, one of the most important classics of India which describes the life and times of Lord Krishna. Keshav blogged as he painted, re-telling the stories in the process. 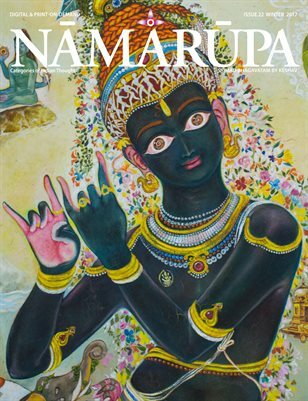 In Issue 22, Namarupa publishes this vibrant painting and its multi-faceted stories. Also included is an interview with Keshav. 10% of the sales of ISSUE 22 will go towards NAMARUPA BHANDAVA to help KASHIKA construct a community center in the Himalayas. See www.namarupa.org to learn more.